Hurricane season is here! We got an early start with Tropical Storm Alberto recently when it dropped around 12 inches of rain in our mountains over the span of a couple of days. Did a pretty fair amount of damage to roads and property. I was representing buyers who were within 24 hours of their $20,000 earnest money becoming non-refundable only to find that the large concrete retaining wall behind the house they were buying had been washed out underneath and the hillside below had disappeared down the mountain. In another part of Buncombe County, NC Highway 9 is still closed to all traffic due to a slide. In recent months, the scuttlebutt about cyber attacks, nuclear war with Korea and such has gone way down. Those threats are still as real as ever, but just not as much on everyone’s minds these days. But with hurricane season now here, its wise to get your household ready because any sort of emergency can hit without warning. So make sure you have batteries, flashlights, a radio, water, some cash on hand, the propane tank for the grill topped off and keep your gas tanks at least half full. Its also good to have a couple of large tarps on hand in the event a tree falls on your roof. And did I mention duct tape? Its the magic bullet for many things. 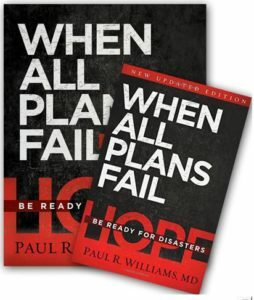 An excellent book given to me a couple of years ago is “When All Plans Fail” by Dr. Paul R. Williams. It provides a very sensible look at natural disasters and how to prepare for them, survive them and then recover from them. Dr. Williams has led over 200 teams on disaster relief missions around the globe over the past 20 years. He knows of what he speaks. So enjoy your summer vacation times, but remember to heed those hurricane warnings when they come and like every good Boy Scout “Be Prepared”..